Team boss Carl Johnson insists Panthers cannot afford to carry passengers as the SGB Championship play-off chase intensifies. 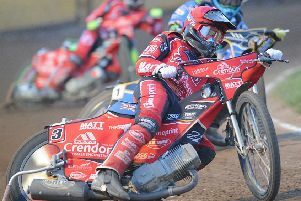 The city team suffered two away defeats in the space of 24 hours last weekend - going down heavily 55-35 at Berwick on Saturday despite a magnificent paid maximum from Scott Nicholls ahead of a narrow 47-43 reverse at Newcastle the following night when their number one again starred. But Panthers had two riders struggle in each of those meetings with Bradley Wilson-Dean and Tom Bacon contributing only one point apiece against Berwick before captain Simon Lambert and Emil Grondal failed to score on Sunday when a consolation point extended the club’s lead at the second-tier summit to two points. “We can’t carry anyone at such an important stage of the season,” said Johnson. “We struggled big-time at Berwick with a couple of riders getting hurt and others not scoring points. “We were much better at Newcastle but it is always going to be difficult to win a meeting when two men don’t score. “We know we were robbed of a point by a refereeing decision, but we probably shouldn’t have been in a position where that was even crucial. “Everyone from number one to number seven has to up their game - and I even include Scott in that despite him having such a great weekend. “We’re trying to help all the boys as best we can as a club whether it be with advice before and after a meeting, or on mechanical matters. “The club has bought an engine that Scott rented from us to use at Berwick and the same deal is available to everyone else as well. Another big test lies ahead tonight (Thursday) as Panthers travel to Ipswich for an East Anglian derby date, 7.30pm. The two teams battled out a 45-45 draw at Alwalton earlier this month but the Witches have their top two riders missing tonight. Long-term casualty Danny King - the former British champion from Huntingdon - has been joined on the sidelines by Rory Schlein. They call in GB international Adam Ellis of Lakeside to guest. Johnson added: “We set out with the intention of picking up a point on both nights last weekend and we fell short of that target. “But the positive is we bounced back from a really difficult Saturday with a better result on Sunday to increase our lead at the top of the table. “We have to be realistic and accept that we’re probably not going to finish there now, but it is all about making the top four and being in those play-offs. “As things stand we only have two more meetings scheduled before the cut-off date - unless it is moved back a week as has been rumoured - and we’ll look to win both of them. Paul Starke will continue as Panthers’ chosen guest at Ipswich to cover for the injured Ulrich Ostergaard with the Dane seemingly no nearer to a return from five broken ribs. Ostergaard attempted a practice in his homeland last weekend, but it was quickly aborted with him still in severe pain.